Heyworth Public Library shares materials with area libraries to make it easier to get you what you want. Whether you are looking for an item at Heyworth Public Library that is checked out or you are looking for an item that the library doesn’t own, you may reserve the material by placing a hold on it. You will receive an email or a phone call when the material is available for you to checkout. Occasionally, you will look for an item that is not owned by an area library. As a free service to patrons living in Heyworth Public Library District, the library staff will search all libraries in Illinois in an attempt to locate and request the item for you. A request may be made in person, by phone at (309)473-2313, or online using the Interlibrary Loan Request Form. Log in to the RSA Catalog usingyourbarcode and PIN. Click on LOG IN at the top of the screen. Enter your barcode and PIN. Search the catalog for the item youare interested in requesting. The catalog is set to search our library. However, if you are interested in items we do not own, simply click on the dropdown menu that says Heyworth Public Library and select ALL RSA Libraries. When the material you want appears, click on the Place Hold button. Choose your pickup library if you are reserving a physical item. 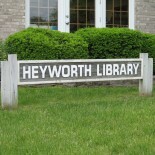 (This option will default to Heyworth Public Library). OR Confirm your email address if you are reserving digital media. You will be notified by email or a phone call when the material is available for you to checkout. How long are reserved items held? Once the item is received by Heyworth Public Library, the item will be held for 10 days.